Click photo to download. 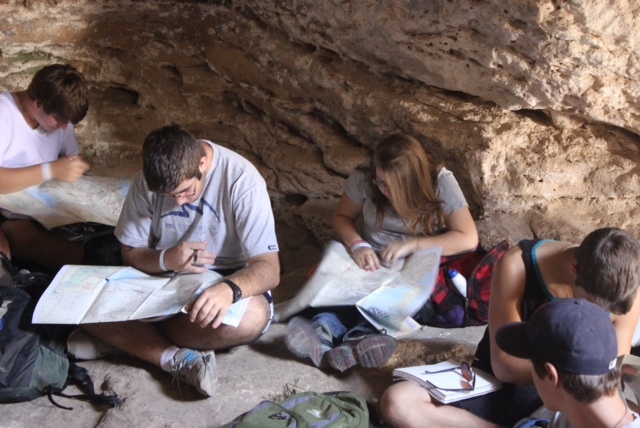 Caption: Participants of the Alexander Muss High School in Israel (AMHSI) program study in a cave near the Madras Ruins just south of Jerusalem. Credit: Lisë Stern. ADULLAM PARK, ISRAEL—I sit in a cave near the Madras Ruins just south of Jerusalem, my legs dusty with the powdery chalk of the rock floor. I’m surrounded by 17 high school students, all busily unfolding oversized maps as their teacher, Rabbi Aubrey Isaacs, instructs them to mark where we are. I see other circled cities and towns—places these students have visited since arriving at the end of August. This onsite “classroom” is one of many tiyulim, or fieldtrips, the group of sophomores, juniors, and seniors is experiencing this fall. They are the inaugural full-semester class participating in the Alexander Muss High School in Israel (AMHSI) program, based in newly built dorms at the Eshel Hanasi agricultural school in the Negev. AMHSI (http://www.amhsi.org), an unaffiliated pluralistic institution, has been around since 1972, offering six- and eight-week sessions throughout the year near Tel Aviv in Hod Hasharon at the Mosenson Youth Village. The program has over 20,000 graduates, including popular singer Matisyahu and The Devil Wears Prada author Lauren Weisberger, as well as numerous rabbis and community leaders. While there have long been college study abroad choices and a recent proliferation of gap-year programs in Israel, not to mention summer youth group trips, AMHSI is just the third organization to offer a high school semester option. Click photo to download. Caption: Participants of the Conservative movement's Tichon Ramah Yerushalayim (Ramah High School Jerusalem) program. Credit: Courtesy National Ramah Commission. “They call us guinea pigs,” laughs Isaac Tarlin, a sophomore from Sharon, Mass. This is Rebekah Davis’s first time in Israel; her mother attended the eight-week program in the 1980s. “She’d always talk about this trip and how great it was,” she says. The sophomore from Miami hadn’t gone to Hebrew school, “So everything in Core is new for me.” Leana Silverberg, a junior who attends a day school in New Jersey, had been to Israel before, “But not on such an educational level,” she says. “At school, we’re learning about Tanach, but I wanted to live it, not just learn it.” Ben Brent, a 10th-grader from Orlando, is a veteran traveler to Israel (this is his 11th time here) who is keeping an ongoing blog called The Temporary Israeli (http://benbrent1.blog.com/?p=15). Click photo to download. Caption: North American Federation of Temple Youth Eisendrath International Exchange (NFTY-EIE) students emerge from the crawling cave at the Madras Ruins south of Jerusalem. Credit: Lisë Stern. Guskin says more than 80 students from 20 states are now enrolled for the spring semester. Like AMHSI, the program includes a stint in Gadna (an introduction to the Israeli army), a Yam le Yam hike (Sea to Sea, a four-day trek between the Sea of Galilee and the Mediterranean), plus a trip to Poland. The Conservative movement’s Tichon Ramah Yerushalayim (literally Ramah High School Jerusalem), known as TRY (http://try.ramah.org.il), is a semester-long program offered in the spring for students in grades 10 to 12. It’s located at the Goldstein Youth Village in the San Simon neighborhood of Jerusalem. There’s also a two month option, known as USY High, which is folded into the semester program; the majority of the 50 to 80 kids enrolled each year stay for the full semester, according to Judy Greene, Israel program coordinator. “Our program is an opportunity for students to live a complete Jewish life in the Conservative Jewish mode while living in Israel,” says Arie Hasit, TRY recruitment coordinator. “We are about exploring Judaism through Israel, and helping students develop their Jewish identities and their relationship to Israel.” Hebrew is a strong component of this; in addition to the Core course covering Jewish history, plus the regular high school classes like algebra and chemistry, students take 3 1/2 hours of Hebrew a week. Youth villages are common in Israel, and are essentially boarding schools, often set up for kids without parents, such as refugees and immigrants. A few other schools, including an arts school and a day school for Israelis, are also on the Goldstein campus, giving the TRY students opportunities to interact with Israelis. Elite Academy, also called Na’aleh (http://www.elite-academy.org), is for the high school student who wants to make aliyah. It’s a three-year commitment, starting with grade 10, under the auspices of the Jewish Agency. Tuition, room and board, and some travel and expenses are covered. Na’aleh is an acronym for “Noar Ole Lifney Hahorim,” youth making aliyah before parents. Lapid (http://www.lapidisrael.org) lists all Israel programs for high school students—most are summer options. Masa (http://www.masaisrael.org/) has a catalog of study choices in Israel, from ulpanim and service programs to graduate university programs. For high school students who study abroad during the spring semester, the Jewish holidays of Purim, Passover, and Shavuot can provide an even more meaningful Israel experience. “I continue to hear from alumni—even from many years ago—who reassert how profound the TRY program was in guiding their life choices,” he says. Posted on October 24, 2012 by Lisë Stern/JNS.org and filed under Israel, Travel, U.S. and tagged Israel Travel.